Este artículo está disponible en Español. Léelo en español. 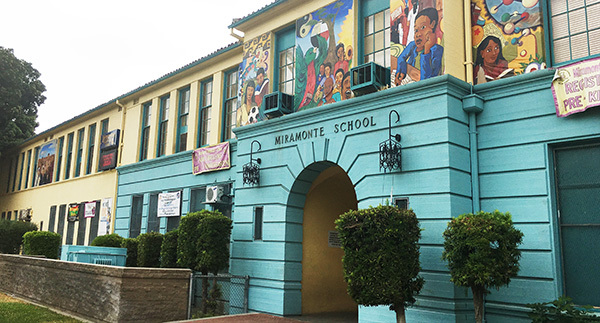 Lead testing at Miramonte Elementary in Los Angeles Unified last January found six water outlets over the state and federal limit for drinking water. An auditorium drinking fountain tested at 10 times the lead limit. Three months later at Audubon Middle School, eight fixtures tested over the lead limit of 15 parts per billion. One water fountain tested at 120 parts per billion. 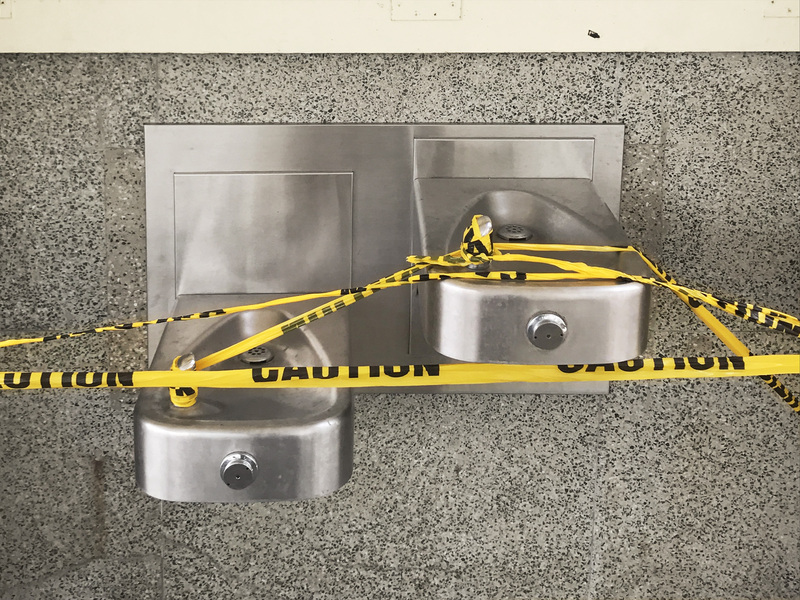 District officials say they shut off the fountains that produced the most alarming lead levels at Audubon Middle in Leimert Park and Miramonte Elementary in the Florence-Firestone neighborhood. But they left three water sources in use at each school that tested above lead limits by flushing the outlets, a standard practice in which school staff run water through the tap for 30 seconds at the start of each day. This article is part two of a special report on lead in California public schools. Part one, Gaps in California law requiring schools to test for lead could leave children at risk, was published yesterday. The third and final part will be published tomorrow. Search lead levels statewide on our interactive map, or read how EdSource analyzed lead test results. Or, find printable factsheets on this page. Los Angeles Unified, the nation’s second-largest district, has spent more than $30 million on lead testing and water system repairs over the last decade with the approval of county health authorities. Yet the district took limited action to remove lead-contaminated fixtures from its schools and its practices fall short of what many experts on the toxic metal say should be done to protect children. Its flushing policy allowed over 300 fixtures to remain in use even though they initially tested above the 15 parts per billion limit, because running the tap for 30 seconds brought their lead levels back under the limit. The district took no action with thousands more fixtures that tested above 5 parts per billion — the federal limit for lead in bottled water — but were at or below 15 parts per billion, the standard for tap water. State and federal regulations don’t require schools to address lead in that range. But the American Academy of Pediatrics, a national pediatricians’ group, says those regulations have nothing to do with what amount of lead in water is safe for children. Water with lead levels at or below 15 parts per billion can still increase lead concentrations in children’s blood, limiting their brain development and putting them at increased risk for behavioral problems. The academy has called for lead limits to be tightened to 1 part per billion. And parents interviewed by EdSource say Los Angeles Unified did not inform them about lead levels over state and federal limits found at their children’s schools. A new state law requires them to be notified. “We were never notified of anything,” said Alannah Ramirez, whose son was a 2nd-grader at Miramonte when tests found contaminated water there. “As parents we should be able to be notified when there’s something like that in our kids’ water,” Ramirez said outside the school in southern Los Angeles County. 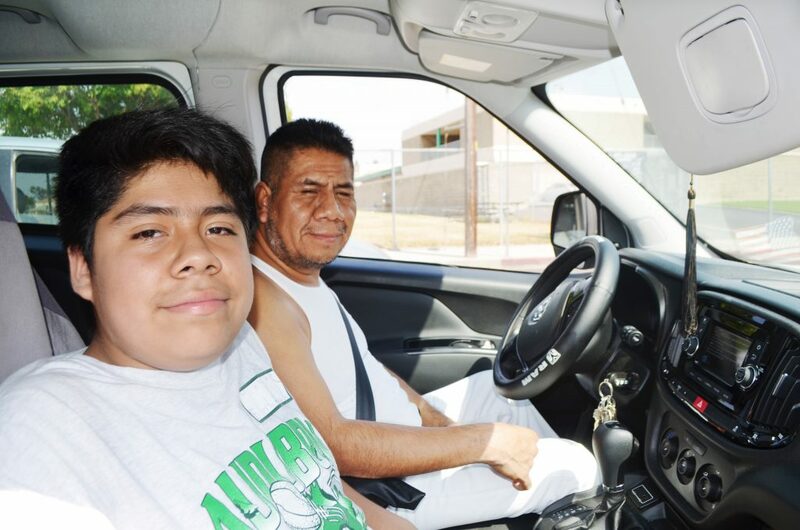 “The school is supposed to tell us what’s wrong with the water,” said Felix Adorno, the father of a 7th-grader at Audubon, who said he was not told about the high lead levels found there either. Felix Adorno, right, said he was never informed about tests that found high lead levels at Audubon Middle School, where his son, Roberto, is in 7th grade. Los Angeles Unified officials describe their program to address lead in drinking water as the largest and most comprehensive effort of its kind in the country. The district’s work to address lead started long before a new California law went into effect this year requiring schools to test their water for the metal. Its tests have been far more extensive than what the law mandates. The district says it has tested every drinking water source at nearly 1,000 schools and other buildings. “What parents should know about L.A. Unified schools is that all of the drinking water is safe,” said Robert Laughton, the district’s director of maintenance and operations. “It has been safe for several decades now and we’re continuing to monitor and mitigate. Testing continues to find lead levels above 15 parts per billion in Los Angeles schools. Tests in early 2018 found lead levels over that limit at 29 Los Angeles Unified schools and district facilities. Flushing allowed the district to keep 329 fixtures, as of mid-May, in use even though they initially tested above 15 parts per billion. District policy has been to shut down fixtures that continued to test above the limit after running water through them for 30 seconds. The district plans to end flushing by the end of this year. Lower but potentially harmful lead levels in water are widespread. Nearly a quarter of Los Angeles Unified’s water outlets tested above 5 parts per billion, the federal bottled water limit, but below 15 parts per billion. Of the 991 schools and facilities where tests were conducted since 2008, 772 had at least one fixture with lead levels in that range. The district insists those fixtures are safe. 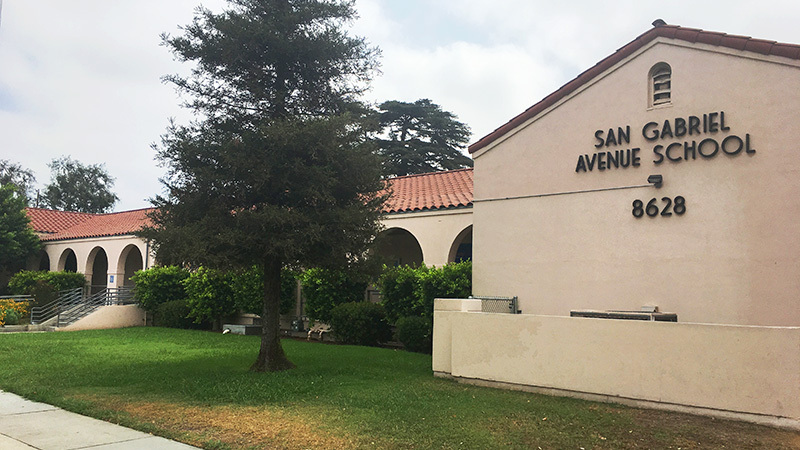 At San Gabriel Avenue Elementary in South Gate, 51 of the school’s 55 water outlets, including all but one of its drinking fountains, had lead levels between 5 and 15 parts per billion. What tests found: Nearly every water fixture — 51 of the 55 outlets tested at the school, and all but one of its drinking fountains — had lead levels between 5 and 15 parts per billion. Those levels are lower than the state and federal action level for lead in tap water of over 15 parts per billion, which Los Angeles uses to determine when to repair fixtures, but higher than the federal standard for bottled water. The district’s response: The school’s water poses no risk because none of its fixtures tested over 15 parts per billion. Records show the district has kept nearly all of the outlets with levels between 5 and 15 parts per billion in use. All but two were last tested in 2008. What critics say: The 15 parts per billion standard is not based on what is healthy or safe for children. Water with lead levels under that amount can be harmful, health experts said. Leaving those fixtures in use puts children at risk and the district is wrong to say they are not a hazard. Dr. Jennifer Lowry, a pediatrician and chairwoman of the American Academy of Pediatrics Council on Environmental Health, disagreed. Lowry said Los Angeles Unified “cannot tell the families that there is no risk” at schools such as San Gabriel Avenue Elementary. “We know there is no safe lead level,” said Lowry, whose organization represents 64,000 pediatricians and other physicians who work with children. Under California’s lead testing law, which went into effect Jan. 1, schools are required to notify parents of lead test results over 15 parts per billion. When asked whether the district notified parents of lead test results over 15 parts per billion this year, a spokeswoman said only that the district posts its lead test results on its web site. But parents interviewed by EdSource at several schools said they should have been told directly. “If you knew that you (had) a danger among the kids, why not inform the parents, kids, staff as soon as possible?” said Donna Polk, whose son graduated from Audubon Middle School last spring. Like other parents, Polk said she heard nothing from the district about lead in the school’s water. What tests found: Six fixtures tested last January had lead levels over 15 parts per billion, the federal standard, including a drinking fountain where water tested at 154 parts per billion. The district’s response: Three of the fixtures, including that water fountain, were shut down. The other three were kept in use by flushing water through them every morning. Parents interviewed by EdSource say they got no notice from the district. What critics say: Failure to notify parents of lead levels over 15 parts per billion could violate a new California law, which requires schools to test their water for lead and tell parents about high results. “If they received a reading over 15 parts per billion and they failed to notify parents, then they are obviously in violation of the law,” said Assemblywoman Lorena Gonzalez Fletcher, D-San Diego, who introduced the school lead testing legislation. The law does not specify, however, how parents should be notified. The district does not believe it is violating the law, according to Laughton, because since February it has posted the results of water testing on its website. But the website omits crucial information. Los Angeles Unified’s practice has been to remove test results from its website once a water fixture has been shut down, meaning parents may never know if their children had been exposed to water with dangerous levels of lead. The webpages listing test results from Miramonte Elementary School and Audubon Middle School currently contain no mention of the fixtures at each school where water tested at lead levels over 100 parts per billion last school year. Those results were included in data given to EdSource in May. And the test results Los Angeles Unified began posting earlier this year are not easily found on the district’s website. One sentence in the district’s nearly 60-page Parent/Student Handbook for the 2018-19 school year directs parents to a webpage about lead testing efforts. Unlike other district communications with parents, the test results are available only in English. From 1988 until 2015, staff at all Los Angeles Unified schools were directed to flush every drinking water source for 30 seconds before students arrived each day. Los Angeles Unified’s lead tests were made up of two samples: One that captured the first water to come out of a fixture after letting the water sit at least overnight and a second after running the tap for 30 seconds. Lead levels in the second test are typically much lower than the first because running the tap for 30 seconds gets rid of stagnant water. District officials say flushing protected children from lead exposure and was an inexpensive solution when Los Angeles Unified lacked funding for remediation work that is now underway. 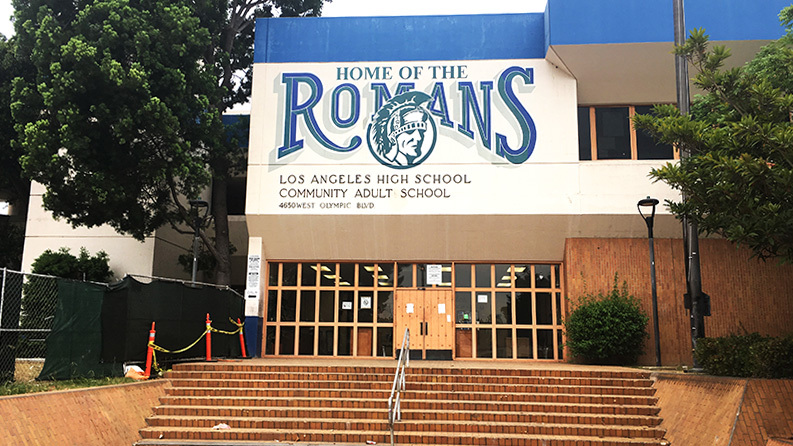 Los Angeles Unified received $20 million in 2015 to bring the flushing program to an end by repairing or permanently shutting down fixtures that tested above 15 parts per billion. The district also spent $10 million in 2010 to install lead water filters at all of its child development centers. Of the 863 district sites that were required to flush their water each day, 27 were still doing so as of Aug. 27, according to Los Angeles Unified records. Spokeswoman Elvia Perez said the district plans to have all schools stop flushing by the end of 2018. What tests found: Water from 22 of the school’s fixtures had levels of lead above 15 parts per billion, the federal and state limits, when they were tested in 2008. Four of those fixtures had lead levels over 100 parts per billion, including a drinking fountain that tested at 200 parts per billion. The district’s response: Officials kept all of the fixtures in use under the district’s flushing policy because none tested over 15 parts per billion after running water for 30 seconds. School workers were directed to flush water fixtures every morning to prevent lead exposure. District data show and officials confirmed that no new testing of those fixtures occurred between 2008 and May 2018. What critics say: The district was wrong to rely on flushing at the school because of the very high lead levels that were found in 2008. It should have repaired those fixtures instead. Officials also should have retested the fixtures sooner to see if their lead concentrations worsened over the years. When asked whether it endorses flushing, the Los Angeles County Department of Public Health noted the practice is recommended by state and federal agencies, including the State Water Resource Control Board which enforces California’s lead testing law. Those agencies recommend flushing as a temporary strategy to limit lead exposure. But Elin Warn Betanzo, a former Environmental Protection Agency official who helped expose lead-contaminated water in Flint and now runs a drinking water consulting firm in Michigan, said Los Angeles Unified relied on flushing in inappropriate cases. As of mid-May, the district had 30 fixtures in use that at various times over the last decade had initially tested over 100 parts per billion, according to its database. Flushing allowed them to remain in use because their lead levels were under 15 parts per billion after a 30-second flush. Four of those fixtures were at Los Angeles High School in central Los Angeles, including a drinking fountain that tested at 200 parts per billion. Eighteen other water outlets at the school tested above 15 parts per billion. Those tests were conducted in 2008, but district data show all 22 fixtures were kept in use and not retested at least through mid-May because each tested under 15 parts per billion after running the tap for 30 seconds. The district’s website says four remain active. Betanzo also questioned the effectiveness of flushing more broadly, citing a study published in April in the journal Water Research that found lead levels in water can rebuild within half an hour after fixtures are flushed. “Flushing it and calling it a day, I think, is putting your students at risk of exposure,” Betanzo said. It sounds like the City of Los Angeles needs to pass a Bond measure that would be dedicated to re-piping the schools with the highest leads levels. If the comunity is really this concerned about having clean, lead free water for their children to drink, it should not be a problem getting another bond measure to pass. As a parent this makes me think, if water at schools are this bad how about the water at my residence? Does the county/ city require builders or water suppliers to do test as well? Either way, the school districts need to fix this and the state should find a way to pay for since most of the schools in California are underfunded. Seriously, we pay so much in taxes for so many programs and yet we always cut short our children’s safety and quality of education.